Egypt, 1955. Cairo is a veritable den of spies. Everyone distrusts everyone, everyone plots against everyone: the British, the French, the Soviets, the family of the deposed King Farouk struggling to regain his throne, and the Eagles of Cheops, a religious sect thirsting for power. The President of France, René Coty, dispatches his master weapon to bring order to this bedlam before all hell breaks loose. 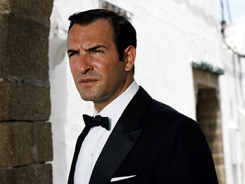 Its name: Hubert Bonisseur de la Bath, alias Agent OSS 117.